What Will You See on the Alpine Pond Trail in Utah? The Beehive State is home to more hiking trails than you can shake a walking stick at. A diverse array of landscapes, challenging terrain, and drastic changes in altitude can make hiking with the family difficult in some areas. Fortunately, there are several fantastic group hiking locations near Brian Head and Cedar Breaks, especially the Utah Alpine Pond Trail. This easy loop trail rewards hikers with beautiful wildflower fields in the summer, towering pine and spruce trees, and sweeping views of Cedar Breaks National Monument. 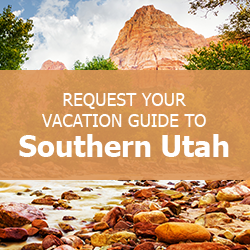 If you want to find other great hiking opportunities, outdoor activities, and sights in the area, request access to our free Southern Utah Vacation Guide! The Alpine Pond Trail in Utah is a fantastic place to get out and see the forest-shrouded edges of Cedar Breaks National Monument, beautiful fields of bright flowers, and a peaceful pond. There are two trailheads on either side of the 2.2-mile loop that are both good starting points for your hike. The Chessman Ridge Overlook provides scenic views of Cedar Breaks, but the northern trailhead has more parking and is closer to Alpine Pond. Fields full of wildflowers and birds dot the first half mile of the pathway coming from the northern trailhead before arriving at the pond. This peaceful body of water is a pleasant place to stop and enjoy a snack before you walk through spruce and pine forests to the scenic overlook. Once you take in the fantastic views, head back around the other portion of the loop back to your car! The Alpine Pond Trail in Utah is an incredibly easy trail for all ages. There is very little change in elevation, and the clear dirt path does not have any challenging rocky portions. Families will love taking a leisurely hike through the woods. Bring your camera and a pair of binoculars for bird watching and photography in the fields along the trail. Wildflowers are in full bloom during the summer, and a variety of birds can be seen perching on trees and zipping across the brightly colored backdrop of the Alpine Pond Trail. The view from the Chessman Ridge Overlook is the cherry on top of the entire hike. You can easily take plenty of gorgeous shots of the sprawling Cedar Breaks National Monument canyon winding its way through Southern Utah. If you’re looking for a vacation home or condo that is close to all of the action in Southern Utah, Family Time Vacation Rentals has the perfect place for you! We offer an extensive collection of properties in Parowan, Brian Head, Panguitch, and Duck Creek Village, where you’ll never be more than 30 minutes to an hour away from Zion National Park, Bryce Canyon National Park, Cedar Breaks National Monument, and other breathtaking hotspots! Adventurers will love all of the fantastic activities like ATV riding, fishing, and biking. You’ll also find fun and exciting winter activities like snowboarding, skiing, and tubing. Ready to explore our awe-inspiring area? Start planning your trip by booking your home today! We look forward to welcoming you to Southern Utah!